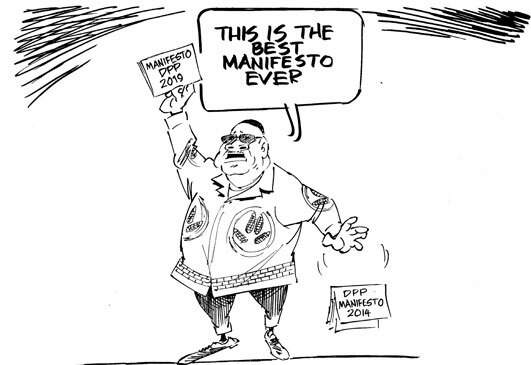 In the strictest sense, the governing DPP should not have come up with a new manifesto as the party did on Sunday in Lilongwe at a function full of glitz, glamour and razzmatazz. On the contrary, they should have, first of all, been accountable for their spectacular failure to implement some of the key issues in their 2014 manifesto, some of which are a great worry to Malawians. I hold the view that making more big promises to Malawians when another set of promises went begging is a case of insulting them. The only promises President Peter Mutharika has kept without aberrations is his pledge to Malawians in 2014 that he would maintain a lean 20-member Cabinet and stabilise the economy although the benefits are yet to trickle down to the ground in the most fundamental way. Industry is still reeling in economic difficulties that are hampering real economic growth. On the contrary, governing made the President change his mind on most issues that matter to Malawians. Malawians know what corruption and fraud are doing to their hard-earned tax kwacha and, probably, some voters gave Mutharika the nod in 2014 because he promised to free the Anti-Corruption Bureau (ACB) from the yoke of the Executive by pledging to change the law so that the body owes no allegiance to the presidency. This would have ensured that the bureau would go freely after anybody in government without fear of reprisals on the safety of tenure of its top officers who are appointed by the President. Upon assuming power, the President changed his mind and his MPs in Parliament even blocked such a bill from an opposition MCP MP. The fight against corruption is the weakest link as far as the DPP’s attempt to be retained in government is concerned. And it has been compounded, in the last five years, by massive plunder of resources leading to the unresolved audit by the National Audit Office which established that K236 billion went down the drain. The President spent the better part of the last five years disputing this and defending his ministers, claiming that they are clean on corruption. As he was doing this, there was massive plunder in police and other State agencies such as Escom. The DPP administration is also weak on energy as Malawians and industries have suffered massive energy problems for the past five years, living in constant blackouts amid government fumbling on solving the problem once and for all. As we speak, any slight problem such as low water flow or high flow that results in silt leads to Egenco failing to generate enough power for distribution to Malawians. Simply put, DPP has also been weak on energy and Malawians have suffered greatly. My view is that DPP should have first of all gone down on their knees in penance to Malawians on these and other matters where they have been weak. They should have come up with a better plan on these matters. 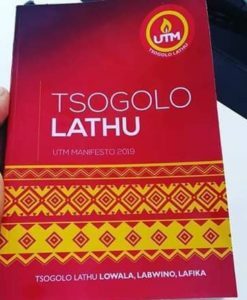 But what we have seen is another 119-page DPP manifesto entitled ‘Sustaining a People-centred Government’ that encapsulates another set of wild promises that DPP is, once again, making that have almost a zero chance of being implemented in the next five years. On infrastructure, for example, DPP is promising Malawians that it will construct a dual-carriage way from Blantyre to Mzuzu. This is a massive project, bigger and longer than all the roads that all successive governments have built in the multiparty era. The question is: Where will DPP find money to change the face of the M1 Road that took ages and massive resources for the first MCP government under founding president, the late Dr Hastings Kamuzu Banda, to build? On education, the manifesto is making ambitious promises, notably the promise to procure a desk for each and every pupil in Malawi. My problem with this promise and indeed other complicated and expensive promises that other parties have made on education is that they are forgetting simple basic things that must be dealt with such as construction of classroom blocks. Do these parties get it that we have primary school pupils in this country that are still learning under trees? On health, DPP is promising universal coverage and recruitment of doctors and nurses, yet reality on the ground shows that the DPP government has used State resources to train these professionals but refused to employ them afterwards when they are needed in the hospitals by dying patients. In the end, the health sector has crumbled and our hospitals have become death-waiting rooms for poor folks who cannot afford services in private hospitals or be flown to foreign facilities as most of our politicians are entitled to. I can go on and on tearing apart the DPP manifesto but the bottom line is that the party did not need to concoct another set of promises to Malawians which they pretty well know they are bound to break as their track record has shown in the past five years. They need to be accountable and ask for mercy from Malawians to have another go at government after May 21 based on the promise that they will fulfil the remaining key pledges made in 2014. Malawians are not daft and should be respected.